I recently struck up an online conversation with Han, an aspiring animator/artist. 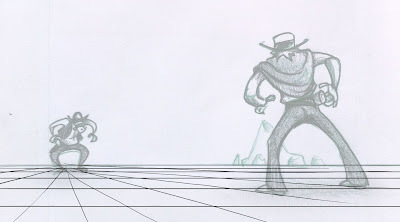 She just posted her first pass at storyboarding on her blog, which I was thoroughly impressed with (without question better than any of my first few attempts). I had some advice for her, primarily some principles she could look to incorporate into her boards as she moves forward, that I think will really help take her sequences to the next level. She was kind enough to allow me to post my notes here, so that others could benefit and learn from her work! To illustrate the principles and techniques, I took a single panel from her sequence and drew over it. I gradually built up a new panel using hers as a starting point. Conceptually, it is a good. -She has clearly established a screen relationship between two characters (left and right). -Suggested a certain degree of depth. My main note, push it! push it good! Push the depth! Push the background! Take the concept of this shot and push it to find a more interesting and compelling compostition. I started my redraw with a horizon line and laying down a grid. Trust me, lay down your grids, it'll help! In her original panel, there is a lot of empty space around the characters, not particularly interesting visually. I drew over the characters, using my grid as a guide, and tried to push the depth. 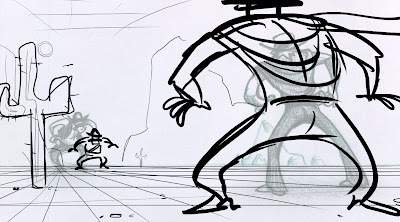 By pushing the depth, bringing one character closer and pushing one further away, you can create a much more engaging composition, as well as utlizing the real estate of the panel more effectively. You can use background elements to enhance a composition and direct the eye. The important information in the above panel is the charatcers, so everything else in the composition should support that. Keeping that in mind, we can use mountain ranges in the background to help lead the eye to the character. Put some junk in the mid-ground. In the original panel the shading was a bit too detailed yet oddly unspecific. You can simplify the shading by thinking about it in terms of foreground, midground and background. I did a quick shade pass over the panel using each object's relative position in the composition, how close/far away it is from us, and shaded accordingly. We can also use shadows to help direct the eye (just like the background) by having them point towards other important information. 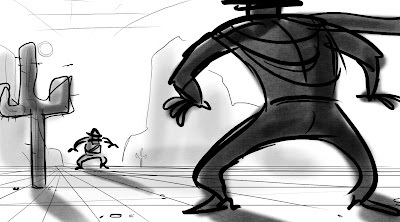 With storyboarding it is just a matter of getting sequences under your belt, the more you board, the better you get, plain and simple. Don't be discouraged if you don't see immediate improvement. It takes time for these principles to become second nature, the most important thing is that you are aware of them and how they can affect your work. Han is off to an amazing start, I can't wait to see where she goes from here! A big thanks to Han for allowing me to post this here. If you've taken anything away from this little break down, please visit Han's blog and thank her! It wouldn't have been possible without her hard work and generosity. Cheers big time for your advice - really awesome! Will definitely take it on board and feel sooooooooooo honoured that you would take the time to give me the feedback. Being tucked away down here in NZ I'm often a little jealous of the opportunities that American animation students must get to receive input from epic people in animation who have worked for the big studios we all aspire to work at. So yay for the internet for giving me a similar experience! Lucky girl! This is an awesome post. Thank you. This is amazing! Thanks so much for the wonderful information! Us young artists are really lucky that the internet blesses us with experienced professionals willing to turn us into cartoon masterminds. Hat, I'm learning a lot with your storyboard adevices! I'm sharing your tips with my workmates! Your are right about drawing grids, it helps a lot, so, I'm trying to draw it as much as I can! I'm so glad to see you are improving your skills day by day and I wish you all the best! Freaking fantastic !! Thanks ! Keep the storyboarding tips coming, they are really helpful !